The ranking-positions of the nation’s biggest-population urban areas other than Houston for 2018 were: New York in 11th spot ($627 million); Los Angeles in 16th ($526 million); and Chicago in 18th ($483 million). There were surprisingly far-down placements – i.e., not appearing among the Top 25 − for some of the nation’s major cities that have otherwise garnered attention for their rapid population increases or their well-regarded economic prosperity. Included in such a grouping, noteworthy for lackluster medical facility starts in 2018, are: Austin, TX, in position number 36; Nashville, TN, 39; Jacksonville, FL, 44; San Antonio, TX, 45; San Diego, CA, 51; San Francisco-Oakland, CA, 57; Riverside, CA, 65; and San Jose, CA, 77. 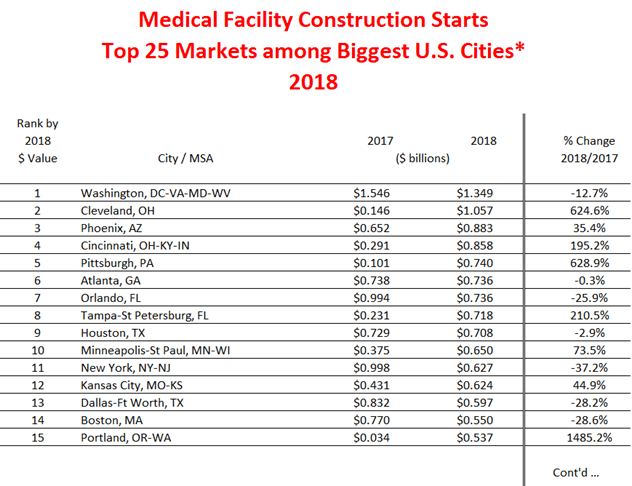 There are an inordinate number of cities in California appearing in the tally of U.S. urban areas with relatively weak dollar volumes of medical facility starts in 2018. By the way, in the City by the Bay, the dollar volume of medical facility starts in 2018 was almost exactly split 50-50 between San Francisco and Oakland. Table 1 features only cities of a million or more each. If smaller cities of less than a million residents were included in the ranking, five would have made it into the Top 25. Those five less-populous urban areas with exceptional levels of medical facility starts in 2018 were: Lansing, MI, $452.7 million; Fresno, CA, $397.5 million; Bloomington, Indiana, $393.4 million; Rochester, NY, $373.2 million; and Durham, NC, $360.9 million. This entry was posted on Tuesday, February 12th, 2019 at 12:08 pm. You can follow any responses to this entry through the RSS 2.0 feed. You can leave a response, or trackback from your own site.